A distinctive style of London tempera paintings by Jan Gordon featured in an exhibition held at the Lefevre Galleries in March-April1937 (The Observer, 1937, March 14th), together with a series of oil paintings and sketches by Cora Gordon. Douglas P. Bliss wrote the review. "Jan Gordon has one room and Cora Gordon another. He exhibits tempera paintings of everyday compositions, and she oil paintings of sunny towns. Both are essentially designers rather than draughtsmen in the Slade School sense. They like broad, squarish pattern, clear-cut, and forms with a line round them. And they like colour, lots of it, sonorous reds, shrill yellows, and exhilarating blues. In pattern and colour they believe in no half measures." "Cora Gordon's sunny Spanish towns afford her, of course, every justification for brilliant colour, and she whole-heartedly responds to the challenge of her subjects. She screws up her colour to such a pitch that she sometimes ends with pure vermilion in the shadows. But no harm is done. She is highly experienced in these matters, and her pictures invariably cohere. For she knows how to relate colours so that they become Colour, how to put in a firm black to hold together a riot of brilliant hues, how to place a spot of fierce colour so that it will keep vigorous a passage that tends to become insipid." "Jan Gordon cheerfully insists that London is as colourful as Spain. He makes it so. The bulk of his pictures here are London scenes, in which he notes with consistent good-humour the face of every day life, in streets and shops, at work and at play. He achieves the happy equilibrium between the claims of nature and the claims of style. He shows us things which have amused him in life, and in so doing makes good decorations. He has a delightful design of girl cyclists pedalling hard on a "Man Hunt," and another of motor-cyclists resting at a roadside "pull-up." The gaucherie of their attitudes is strikingly expressed. I like, too, "Casting Reflections" - in which he seems to have set out to show the full chromatic and textural resources of his medium, tempera. Other notable paintings are "Sandwichmen" and "The Swingboard."" "In the hall are drawings by the Gordons. These, for the most part, are made with a few scampering lines. Jan is less nimble than his wife, who sketches most wittily. Some of her heads and animal sketches are delightful exercises in free, careless-seeming line-work." 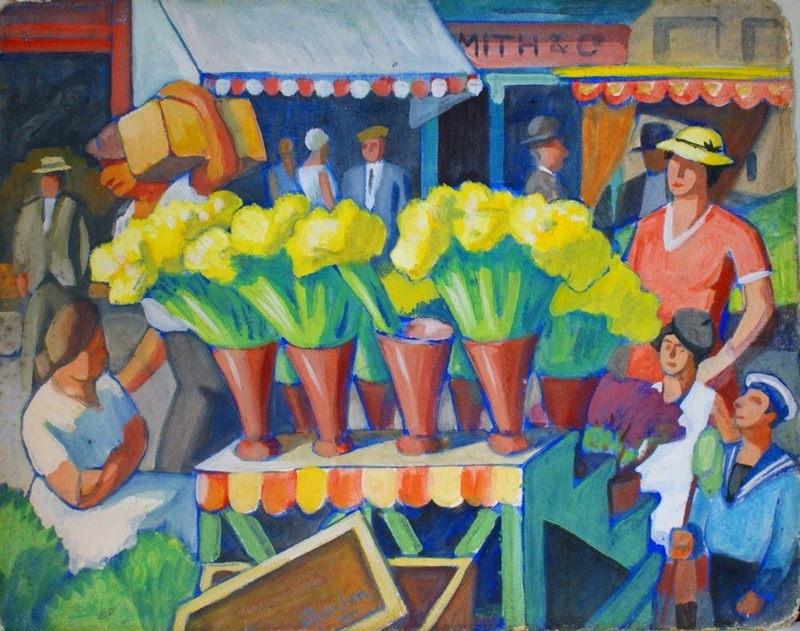 London scene, tempera, by Jan Gordon, 1930s. My grandfather (Ashley Smith) bought a good number of these. Reference: Catalogue of oil paintings by Cora J. Gordon and tempera paintings by Jan Gordon : March-April, 1937.London : Alex. Reid & Lefevre, Ltd., 1937.